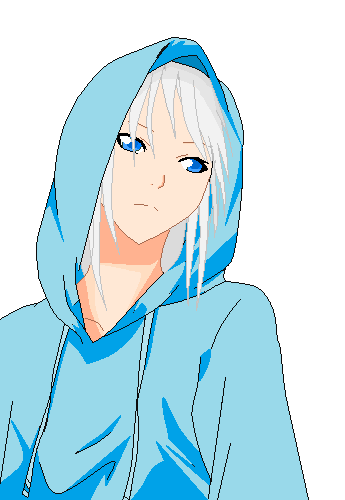 Outfit: She has long white/gray-ish hair and blue eyes and pale skin. She wears a blue-ish long-sleeve hoodie with black leggings and blue-ish high top sneakers. Parts of her past: She was a princess in a kingdom of her time. She was cursed by a wandering witch and obtained somewhat ice magic/power/ability to control ice. She froze her kingdom with her magic (reasons undefined) and cast herself away or locked herself away out of guilt ( it is undefined as the story/legend constantly changes from time to time). She then live an immortal solitary life due to her ice magic until a person rescued her from her own 'abyss'. Personality : Shy. She tends to cry when she make anyone unhappy (or equivalent). She still have a slight feeling of guilt when around people. Kind at heart. She often pull a fake smile but when she actually smile it is said that she smiles like an angel. She will never tell anyone about her actual age unless they are really close to her.